Donations to CMHA Halifax- Dartmouth Branch support our social programs and initiatives and the resilience, recovery/well-being of people living with mental illness and mental health problems. We strive to create an environment of hope, to reduce stigma, and to promote mental health for all. Visit Instagram/facebook/twitter@CMHAHalDart for regular updates on our activities. Thank-you to everyone who donated and/or shared information about our GoFundMe campaign! We have covered our deficit. It was a challenging year and we are grateful for the support received from individuals, funders and sponsors. June Jollymore endured long hospitalizations after her diagnosis of borderline schizophrenia and manic depression at the age of 19, and later in life with manic depression and anxiety. She felt at times that suicide was her only way to escape it. 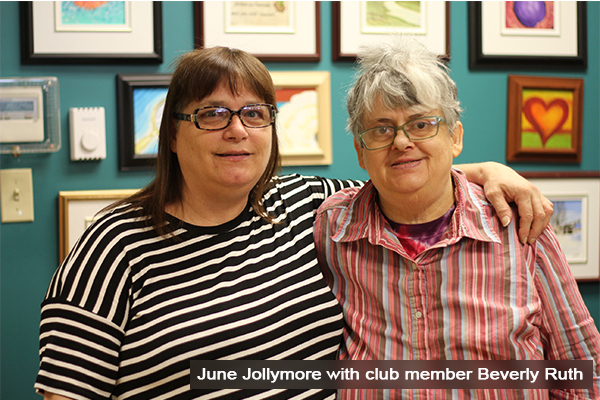 It was only after attending a social club program for adults living with mental illness — connecting with people experiencing the same struggles — that June says she felt free to be herself. But the social club programs that changed June’s life are in danger of being cut back due to a projected deficit in funding. June’s children are all grown up and she says her friends at the social clubs are her lifeline. Once a membership is received, the clubs operate like a drop-in centre, where everyone’s welcome to come by and stay for as long as they’d like — whether it’s for half an hour or all afternoon. Among Friends Social Club meets at the Dartmouth Senior Service Centre in Dartmouth (45 Ochterloney St.) and Sharing and Caring Social Club meets in Halifax (2020 Gottingen St.). Adults living with mental illness — like June — can take part in gentle exercise, board games and card tournaments, crafting, movie nights, “no-bake” baking sessions, and group walks to Tim Hortons for coffee. They even work together to help organize and host special club events. 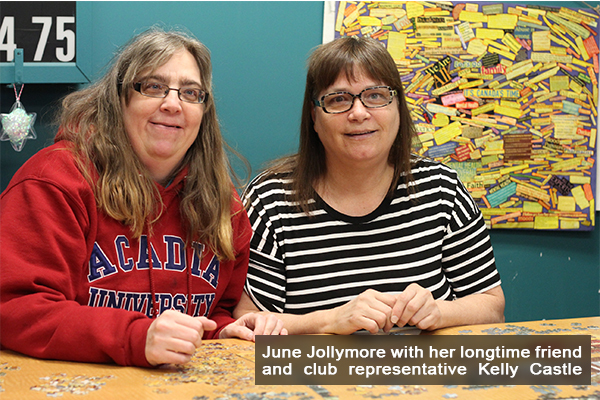 The CMHA’s Halifax/Dartmouth programs are the only ones in the community that focus solely on social support, recreation and leisure for people living with mental illness. While other programs and services have specific diagnosis requirements, CMHA social club coordinators believe in providing a safe, supportive space for anyone touched by mental health issues. Without clubs like Sharing and Caring and Among Friends, June guesses she and her friends would resort to wandering around the city to try to find a safe space. More often than not, she says they’d end up isolating themselves by staying home alone. Inspired by the positive, welcoming environment of the clubs, June enjoys using some of her time to work on her art. One of her coping skills is creating detailed mental health collages of words cut from magazines. It takes her months to complete each collage on a sheet of bristol board, but she finds it soothing to surround herself with positive words that tell her story — and the stories of her friends living with mental illness. Our organization would not be able to provide the services that it does to our local community without the large number of generous volunteers who kindly donate their time and talents. We have volunteer opportunities with our Social Programs, office and Mosaic for Mental Health. If you are interested in volunteering please contact us via email at cmhahal@ns.aliantzinc.ca or phone at (902) 455-5445. Our Mosaic for Mental Health is also a great way to get involved, email mosaic.cmha@bellaliant.com or phone 902 455-5445 if you would like to donate art, become a sponsor or volunteer.